Islands are always a sight to behold, no matter where they are in the world. With these gorgeous patches of land jutting out of the sea come the natural spas of mankind. 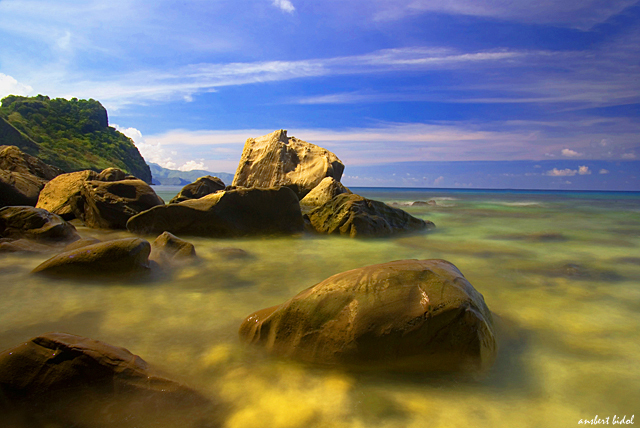 Check out this distinctive gem locked in a little corner of the Philippines, in the northwest province of Zambales. This image alone should spark the water bug within you. Even for those who have done their rounds of commercial beach resorts, this tiny isle will be something entirely new. So what are the perks of visiting this marine jewel? Nestled in the midst of both hideaway and exhibit-worthy coves, Capones Island is one of the most beautiful beaches in the Philippines. It is part of the township of Pundaquit. Known as ‘Isla de Capon Grande’ during the Spanish era, the cylinder-shaped isle is 2 km long and is a 30-minute boat ride from the municipality of San Antonio. Get a taste of heaven on Earth, still pristine even in these hectic modern times. Capones is an island of contrasts. Its terrain comprises a mini forest on one side and golden grass on the other. It is home to one of the most intriguing beaches in the world. Seen from the side, it looks like a man’s face was carved on its cliffs. One half of it boasts the typical white sand (mixed with volcanic ash from nearby Mount Pinatubo) and cool blue waves, making it one of the best beaches in the tropics. The other half is made up of unusual rock and coral formations, limestone cliffs, smooth, creamy boulders, and ethereal streams and fog that make it look like it belongs on another planet! Many photographers, local and international, have captured its otherworldly mystique. Capones Island is the biggest of the island group called "Islas de Punta Capones." From there, visitors discover other visual treats by island hopping. Nearby camera-worthy sites include Camara Island, Nagsasa Cove, Silanguin Cove, and Anawangin Cove. The last one, a favorite of locals, can be crowded during the holidays, but is only a 30-minute cruise from Capones. The less-crowded Nagsasa Cove is 45 minutes to an hour away. Trekkers may choose to hike from Pundaquit to Anawangin Cove. This route will take them about four hours. Hiking: Atop the hill, near the western end of the island, is a heritage site from Spanish colonial times—the solar-powered Capones Lighthouse (Faro de Punta Capones). This lighthouse once guided vessels coming from the north to Subic Bay, Corregidor Island, or Manila Bay. Photography, history and architecture buffs always appreciate this brick structure from 1890, but the 360-degree panoramic view from its overlook deck will surely take anyone’s breath away. Shooting the rapids: Pundaquit has its own waterfalls, which are best experienced during the rainy season. Rock climbing and abseiling: The craggy cliffs are great for these. A note to those who love their creature comforts: as the island is uninhabited, this means no electricity, washrooms, or indoor accommodation. Camping supplies are available for rent, but during peak season, these can go out of stock, so it is advisable for guests to bring their own. Some operators include these in the tour package, plus food, for an additional fee (usually P300 to 400 per person). There is a weak mobile communications signal on the island, but it’s patchy at best. Roughing it has its perks: you see wildlife in its natural habitat, reconnect with Mama Nature, test survival instincts, and awaken the inner photographer or artist in you. Tour guides explain the region’s historical and cultural significance, and its part in the country’s ecotourism industry. The Department of Environment and Natural Resources signed an agreement with the Environmental Protection of Asia Foundation in 2003 for the conversion of the island into a marine-protected area called Capones Island Marine Park. The majestic beauty of the place will surely compel sightseers to grab their cameras and capture their surroundings for sharing later. Selfies aren’t the only means to record experiences. Artists will be inclined to whip out their liquid chalk markers and canvases to recreate experiences, or express thoughts and feelings. For convenience, choose a package from a tour operator in Manila, as they will arrange companion guides as well. Rates range from PHP 1,000 to 20,000 (USD 20 to 400) per person, depending on the number of people in the group. The highest rate is for those traveling solo. Ride a Victory Liner bus going to Iba, the Zambales capital. Get off at San Antonio. Mention your drop-off point when you buy your tickets, so you won’t pay full fare. Travel time is around three to four hours. Take a tricycle to Pundaquit for PHP 80 (USD 1.65). Rent a boat going to Capones Island. Boat rates vary considerably (PHP 1,000 to 1,500 [USD 20 to 30] per round trip) depending on the number of passengers and how many islands you want to visit. So if you’re not in a tour group, choose carefully. Capacities vary, too. Some small boat operators charge as low as PHP 700 (USD 14). Charter an aircraft to International Subic Airport, Castillejos Airstrip, or Iba Local Airport. Then take a bus to San Antonio. From the Cultural Center of the Philippines on Roxas Boulevard in Manila, take the Mount Samat Express Ferry to Subic. Or, from the Mall of Asia, take the one-hour Supercat ferry ride to Orion, Bataan. From there, it’s a one-hour bus ride to Subic. Then take another bus heading to Iba – Zambales—but get off at San Antonio. Have you been to this island or its neighbors? Once you visit, don't forget to share your memories with Versachalk! We would love to learn about your adventures there. Post these in the comment box below.